We love playful clothes that make you feel like dancing such as our Polly and Nina Flamenco style dresses. Well now there is another welcome addition to the twist and shout club . 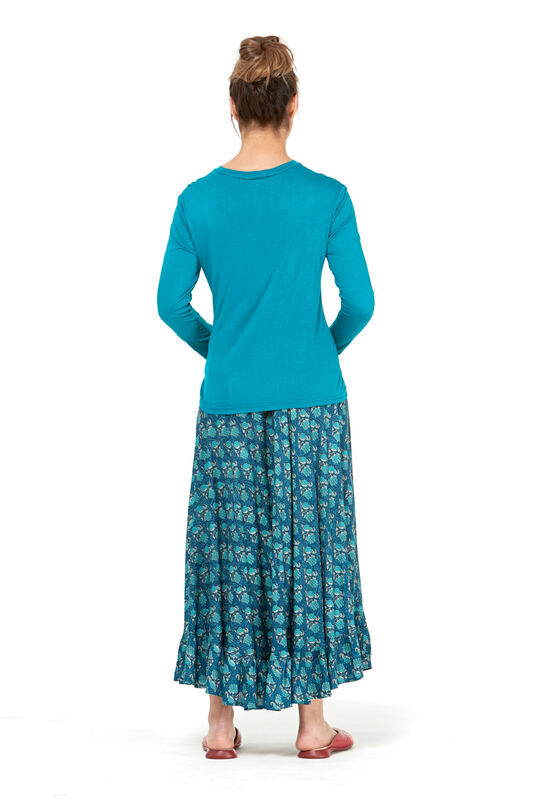 "Gigi" is a relaxed fit skirt with a frill on the asymmetrical hem .There are lots of other great features to the Rasaleela Gigi skirt in this gorgeous draping rayon fabric with elastic shirring at the back waist for a perfect fit . She will take you from day to night, work to play ,styled as you like - try wearing as a strapless dress with a thick woven belt .Now all that is left to do is to throw on a pair of sandals, wedges or boots in the cooler months and Enjoy !